The results are in: as part of a poll conducted by the Office of the Provost, faculty and students have chosen Mac’s best – and worst – classrooms on campus. The survey, which supplemented the university’s annual classroom audit, generated more than 2,700 responses, and has set plans in motion both to address smaller concerns and to start major renovations over the summer. As a result of the survey, the university will be starting major renovations to TSH 120 and TSH B128, which will be completed this summer. CNH 104 and BSB 147 will be reviewed for potential renovations next summer. As well, smaller concerns, such as squeaky doors, inactive power outlets and poor or burnt-out lighting have already started to be addressed. Working groups that include representatives from the Office of the Provost, Registrar’s Office, Facility Rervices, Campus Classroom Technologies and University Technology Services will be addressing issues including an accelerated upgrade of classroom audio-visual equipment, improved cellphone access, cleaning frequency and classroom scheduling. Finally, construction on the Peter George Centre for Living and Learning is on track to be completed for September 2019. The centre will include one large active learning classroom, two large lecture halls, and several classrooms – and will likely give the top classrooms on this year’s survey some stiff competition. The results are in: as part of a poll conducted by the Office of the Provost, faculty and students have chosen Mac's best – and worst – classrooms on campus. The survey, which supplemented the university’s annual classroom audit, generated more than 2,700 responses, and has set plans in motion both to address smaller concerns and to start major renovations over the summer. Mac’s top classrooms are: <ul> <li>R. Wilson Hall (LRW) B1007</li> <li>Michael DeGroote Centre (MDCL) 1305</li> <li>Michael DeGroote Centre (MDCL) 1105</li> <li>Health Sciences Centre (HSC) 1A1</li> </ul> According to respondents, the classrooms that need the most attention are: <ul> <li>Togo Salmon Hall (TSH) 120</li> <li>Chester New Hall (CNH) 104</li> <li>Burke Sciences Building (BSB) 147</li> <li>Togo Salmon Hall B128</li> </ul> In addition to identifying classrooms of concern, the survey collected general and room-specific concerns, including: <ul> <li>Table space for students</li> <li>Classroom configuration and visibility issues</li> <li>Audio-visual equipment issues</li> <li>Temperature and ventilation concerns</li> <li>Broken or missing furniture</li> <li>Lighting</li> </ul> As a result of the survey, the university will be starting major renovations to TSH 120 and TSH B128, which will be completed this summer. CNH 104 and BSB 147 will be reviewed for potential renovations next summer. As well, smaller concerns, such as squeaky doors, inactive power outlets and poor or burnt-out lighting have already started to be addressed. Working groups that include representatives from the Office of the Provost, Registrar’s Office, Facility Rervices, Campus Classroom Technologies and University Technology Services will be addressing issues including an accelerated upgrade of classroom audio-visual equipment, improved cellphone access, cleaning frequency and classroom scheduling. Finally, construction on the Peter George Centre for Living and Learning is on track to be completed for September 2019. 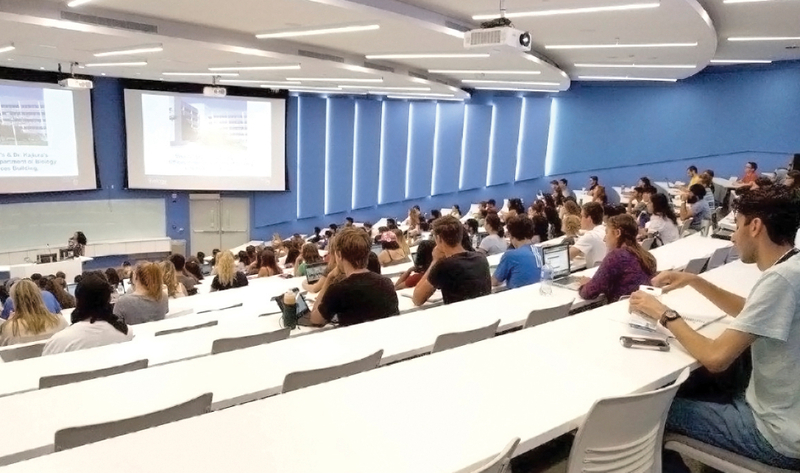 The centre will include one large active learning classroom, two large lecture halls, and several classrooms – and will likely give the top classrooms on this year’s survey some stiff competition.